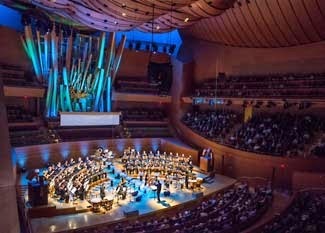 The Los Angeles Master Chorale has always had a flair for the theatrical. Never outstripping their core musicianship, they aren’t afraid to stretch in terms of performance technique. It’s a quality that’s been central to some of their most memorable and talked-about performances, and this weekend the LAMC revisited one of those moments with a re-examination of Tan Dun’s Water Passion after St Matthew. It’s a work that caused quite a stir when they first performed it in 2005 and it’s arguably one of the pieces they’ve become most identified with over the last decade. It’s probably the most important of Tan Dun’s works as well. There is something magical and elemental about this piece, which fuses the passion with ritual, symbolism and a sound world springing from water and everyday percussion. Tan Dun has made much of the clicks and whirls of everyday sound often in the past, and the Water Passion takes a plunge into the splash and pop of water. The work was composed in response to Bach’s St Matthew Passion, and Tan Dun manages quite a feat maintaining a reverence and sense of ritual for the passage of time in a setting that evokes both baptism and rebirth, punctuating the libretto. The chorus revels as much in Tan Dun’s towering vocal climaxes as they do in the many minute percussion chores they are asked to take on. The colorfully lit water basins around the stage form a sort-of cross of their own. The amplified splashing intertwines with the mix of voices and Chinese percussion instruments for an effect that is both profoundly solemn and organically spiritual not unlike the work of John Luther Adams at its best moments. There were two soloists. Baritone Stephen Bryant was both flexible and warm while soprano Delaram Kamareh made a visually arresting presence sometimes in contrast to the proceedings around her. But the performance, under the guidance of Music Director Grant Gershon was seamlessly integrated and just as mysterious and thrilling as it was when the group introduced the work to the region nearly a decade ago. It’s always great to see the LAMC succeed, and this weekend they again proved their aptitude and excellence in the sometimes thorny pathways of contemporary compositions.